POTOMAC, Md. (AP) The cheers were so loud for Tiger Woods that no one could hear the starter announce the name of Joel Dahmen when it was his turn to hit. 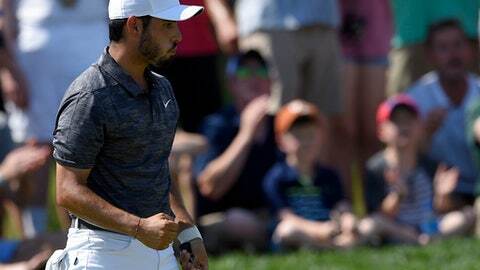 And then it got even rowdier Saturday at the Quicken Loans National with each putt Woods made – 12 feet for par, four in a row for birdie, a 25-foot birdie putt on the ninth hole to head to the back nine just two shots out of the lead. Abraham Ancer heard it all in the group ahead, and it carried him into a share of the 54-hole lead. Ancer had the lowest round of his PGA Tour career, an 8-under 62 on the TPC Potomac at Avenel Farm, and wound up atop the leaderboard with Francesco Molinari (65). It worked out even better than that. Ancer, a 27-year-old Mexican, had never been among the top 10 going into the final round in his previous two starts. Now he’s one round away from his first PGA Tour victory, which is a lot longer than it looks. Molinari, a two-time Ryder Cup player with a World Golf Championship among his credentials, overcame a few putts he missed from short range to close with two birdies to join Ancer at 13-under 197. Ryan Armour (68) and Zac Blair (66) were two shots behind. Woods lost all momentum on the back nine by missing two birdie chances inside 10 feet, taking a bogey on a short par 4 and then driving just through the green on the reachable 14th to 18 feet, chipping strong to 8 feet and missing another birdie chance. He had to settle for a 68 and was six shots behind, making this the seventh straight tournament he has been at least five shots behind going into the final round. It sure didn’t sound that way, and for most of the round, it didn’t look that way. The nine players ahead of him have combined for just five (official) PGA Tour victories. That includes Molinari, a five-time winner in Europe who is No. 17 in the world. He won the HSBC Champions in Shanghai in 2010, before the PGA Tour recognized it as an official victory. He’s making the most of his first trip to the TPC Potomac. Even though he missed a few short putts on the front nine, he closed with a 30-foot birdie putt on the par-3 17th and hit wedge into 5 feet for birdie at the 18th. The course certainly has everyone’s attention. ”You have to hit it good. There’s no way around it,” Ancer said.